The castle was built in medieval times right around the time they were made the walls that surround the village. The work was completed at the beginning of the 13th century. In the late Renaissance, and more specifically at the beginning of the sixteenth century, the structure was completely rebuilt; a subsequent restoration carried out in the early twentieth century in neo-Gothic style has revived the lost medieval styling elements. 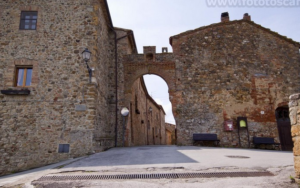 The castle of Porrona leans on the same square where is situated the Church of San Donato. The walls of the outer side coincide with the western corner of the city wall.